Marchettino - The ONLY official website: Jaguar F150?
" 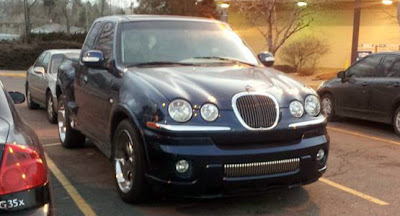 What if I take my Ford F150 and I mix it with a Jaguar? It could become a manly pick up with some british style! " Maybe it was the thought of the owner of this pick up. I certainly know what this car has become, and it's not even remotely good looking or elegant, I don't want to be vulgar, I think you know what it is. A positive thing is that it's prettier than the Gulf Lotus X12 that you have seen recently, but let me say that mixing a Ford F150 with the front of a Jaguar S-Type is everything but a smart idea!